Designed to be more friendly to deeper or larger multi effects pedals, the Pedaltrain Novo 18 still retains the portability of the Metro and.. Designed to be more friendly to deeper or larger multi effects pedals, the Pedaltrain Novo 18 still retains the portability of the Metro and Classic series boards and the rugged aluminium 5-rail design. If you're effects pedal arsenal is growing by the minute, you'll want a trusty pedalboard to secure them on stage or keep them safe in a studio setting. 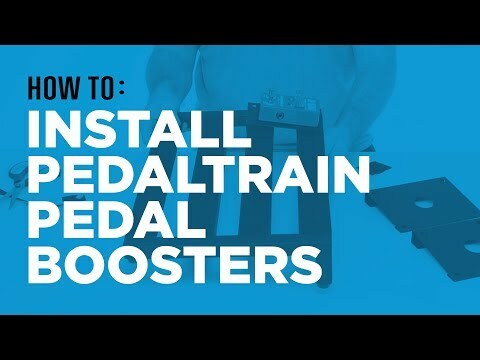 Thanks to Pedaltrain’s new modified rail system and open front design, mounting pedals and power supplies is easier than ever. Even the smallest pedals make an incredibly strong bond with this new rail system. Novo 18’s five-rail design is perfect for players who use true-bypass switchers or need an extra rail to accommodate a variety of pedal configurations. Included with purchase is 90” of Pedaltrain’s professional grade hook-and-loop pedal fastener and plenty of zip ties for securing cables. The Novo 18-SC comes with a padded, protective soft case for easy transport. As well as essential protection for the pedalboard itself, you've got space for your power supply, cables or accessories.